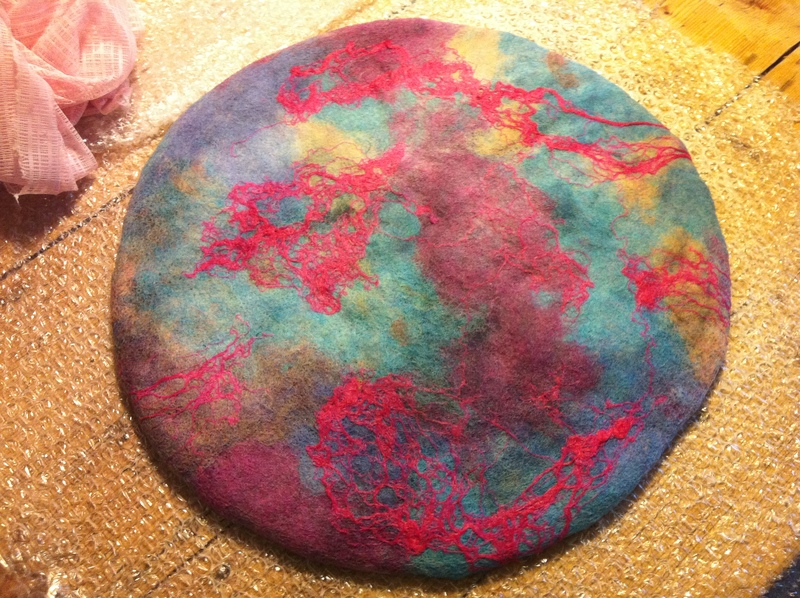 Today has been the perfect day for felting! We woke up this morning to horrendous winds outside, the perfect excuse to hole up inside and join Carmen for a full day of felting! By the time she arrived the winds were increasing and after about another hour of howling and wailing the rain started, great stair rods of water coming down vertically, does anyone else use stair rods as an expression for rain??? Tomorrow afternoon I start my third series of workshops with the Borris Active Retirement group and by request the topic for our first session is ‘felt hats’. I decided to experiment today and felt a beret combining an inner layer of short fibred merino with an outer layer of mohair waste and silk throwsters waste. As a quick aside, I suggest that anyone interested in trying out this mohair waste that Carmen and I are using (Sharon, hope this suggestion helps) goes to their nearest weaving mill and ask if they have any loose fibres left from the brushing process. This is where we have got ours and it has been free to collect as Carmen is a friend of the person, I know that Cushendale Woolen Mill sells their abroad but you just need to ask around and I think you would be able to access some. Anyway, the process for the beret is almost identical to the recent explanation of the mohair vessel with the exception that you don’t create such a deep three dimensional shape as with the vessels, rather stretch and pull the felt into a flattering shape to softly cover your head. As before, the mohair really blended well during the felting process and for this beret I added a wonderful vintage button cover I picked up during last Fall’s workshops at The Tin Thimble in Loomis, CA. The deep lilac in the centre of the button cover is perfect with the turquoise, pink and lilac silk/mohair combination! Head on over to my Flickr photos to see more pictures of the hat in progress as well as one rather dark image of the finished beret, the heavy rain made photography rather trying this afternoon!! !